This unit has been specially designed to give a clean extended bass response in ported cabinets of approximately 3.9 cu. ft. (110 liters). An ideal speaker for portable high power PA and club music systems. 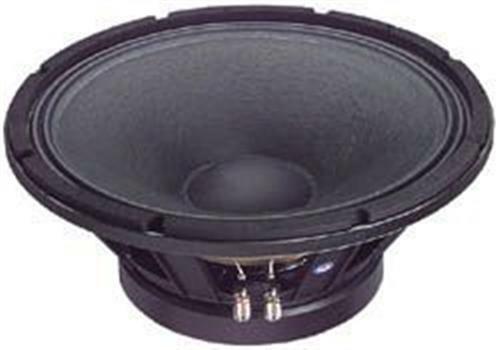 Eminence LF models are specifically designed with extended Xmax to deliver more bass than standard models and provide "a true woofer" for three-way applications. Specifications: * Power handling: 600 watts RMS * Voice coil diameter: 3" * Le: 1.04 mH * Impedance: 8 ohms * Re: 6.12 ohms * Frequency range: 40-2,000 Hz * Magnet weight: 120 oz. * Fs: 35 Hz * Vas: 6 cu. ft. * Qms: 9.57 * Qes: .32 * Qts: .31 * Xmax: 6.03 mm * Dimensions: Overall Diameter: 15.32", Cutout Diameter: 14.0", Mounting Depth: 6.57". Dimensions: Overall Diameter: 15.32", Cutout Diameter: 14.0", Mounting Depth: 6.57".